Note: An edited version of the above article was published in The Golden Legacy column in the national newspaper, The Brunei Times dated 14th April 2007. Since the discovery of oil in 1929, Brunei Darussalam had been known as an oil-exporting country to the point that it is almost impossible to remember the time when Brunei had to rely on other products for its exports. Believe it or not, there have been many exports in the past. 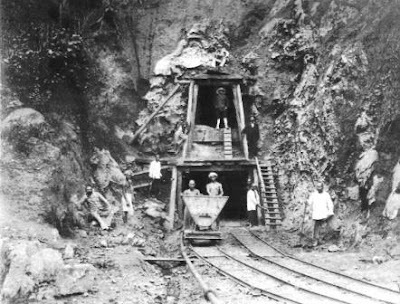 Our famous camphor was one, timber, cutch, rubber and surprisingly, coal. 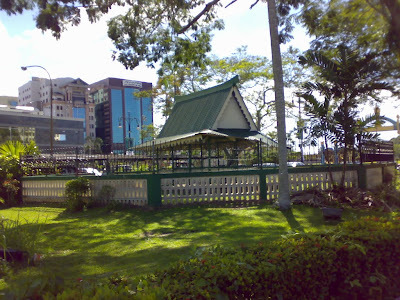 Many people have walked past the walled small roof structure opposite the General Post Office Building in the car park yard of the TAIB Building in Bandar Seri Begawan. Many have in fact parked their cars next to it. However, not many have realized that they are actually parked to a grave. A grave which is very interesting and full of mystery. It is not even known whether it is a grave. It was said that before the World War, the site was actually a huge mound of some thirty feet tall. It was blown up by a bomb during the Second World War and the mound was said to be empty even though according to legend, there should be at least a few people who were buried there. There was this tale of a local boy, who went away to better his and his family’s lot in life. After many years, he achieved success and wealth, married a a noblewoman and became the owner of a huge ship, forgetting his humble roots in the process. One day, in order to take shelter from an impending storm, his ship happened to berth near his birthplace. His ageing poverty stricken mother recognising him rowed out in a canoe calling out to her long lost son. In front of his beautiful rich wife, he was too ashamed to acknowledge her as his mother and threw her overboard. She was shocked and very depressed and placed a curse on her unfilial son whereupon a storm suddenly appeared capsizing the ship and transforming it into rock. Before my son underwent his circumcision, he was curious about what will happen. When I related my own experience, I realized mine was different from his. Since then I discovered that in the older days, there were variations to the ceremonies but also variations to which bits to remove. 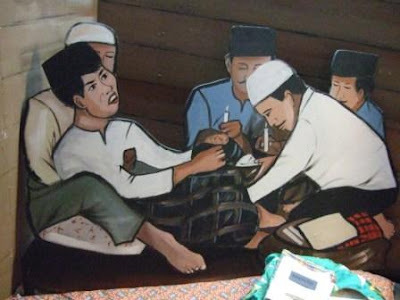 In the earlier days, bersunat is considered as the mark of a true Muslim. Immediately just before the circumcision, the boy would be asked to recite the ‘kalimah sahadat’ which is recited by every Muslims declaring themselves Muslims – and by saying it before the circumcision, made him a true Muslim.